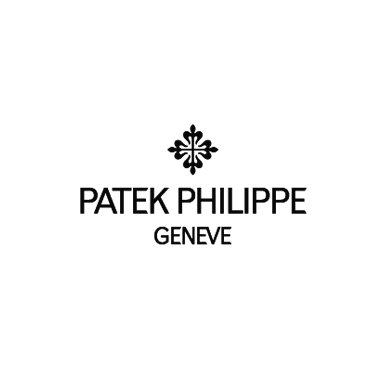 In 2018, Patek Philippe enhances the appeal of its sporty Aquanaut family with the introduction of a very first chronograph in the collection. 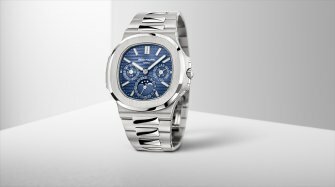 Epitomizing contemporary casual chic with its youthful, modern, and unusual style, the Aquanaut was introduced in 1997. The Aquanaut was presented in feminine (the Aquanaut Luce with a diamond-set bezel) and masculine versions, and is available with the exclusive Travel Time mechanism that displays a second time zone with persuasive simplicity and remarkable clarity. In 2018, the Aquanaut collection welcomes its first chronograph, a complication that perfectly matches the personality of this young and dynamic model range. 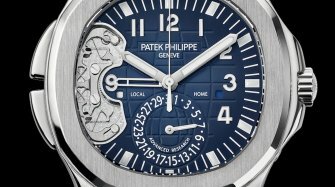 Patek Philippe endowed the new Ref. 5968A-001 with the CH 28-520 C caliber, a self-winding flyback chronograph movement that melds tradition with innovation. It combines classic column-wheel control with the modern, vertical disc clutch which prevents hand bounce and rebound when starting the chronograph. Because this clutch is virtually friction-free, the sweep chronograph hand can also be used as a continuously running seconds hand. This eliminates the need for a seconds subdial. Thanks to the flyback function, the owner can actuate the pusher to initiate a new measurement while the chronograph hand is running, which makes a reset superfluous. The transition from the chronograph to the running seconds function allows the watch to be synchronized with a time signal by using the stop seconds feature. 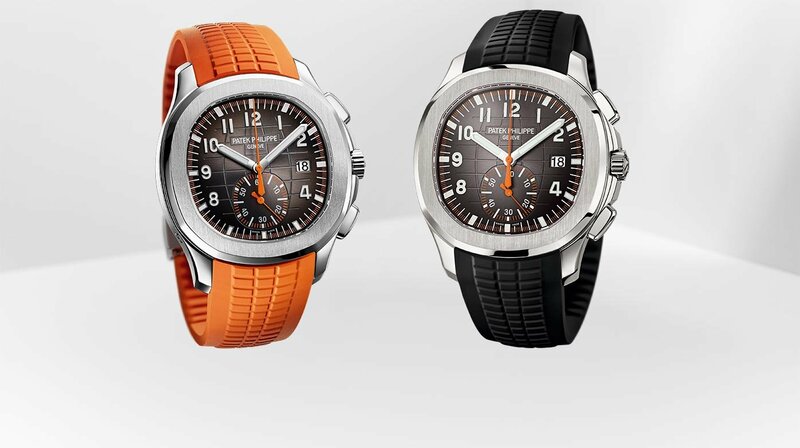 The aesthetic of this new timepiece in steel harmoniously integrates the chronograph in the exclusive Aquanaut design. The 60-minute counter at 6 o'clock adopts the characteristic contours of the gently rounded octagonal bezel. The elongated pushers are harmoniously integrated on both sides of the crown protector. 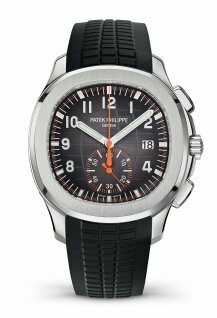 The chronograph displays (chronograph hand, the peripheral railway track scale with quarter-second divisions, 60-minute counter) are orange and contrast well against the black dial with the typical Aquanaut embossed pattern. 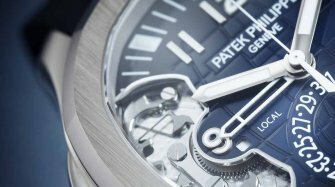 Legibility is guaranteed by applied Arabic numerals in white gold and the broad baton hands – all with luminous coatings. 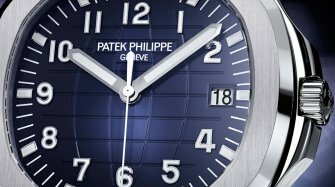 Thanks to its screw-down crown, the rugged case is water resistant to 120 m. It exhibits a refined alternation of satin-finished surfaces and flanks, producing the same interplay of light as the bezel with its smooth glossy surfaces and polished chamfers. 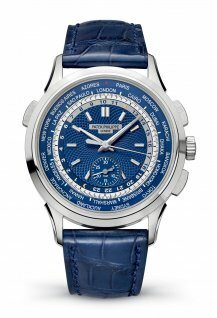 The composite strap is embossed like the dial. It is very comfortable on the wrist and highly resistant to abrasion and wear as well as to salt water and UV radiation. This model is delivered with two straps: a black one (standard issue) and an orange one that amplifies the bold accents of the dial. With the new Aquanaut Chronograph Ref. 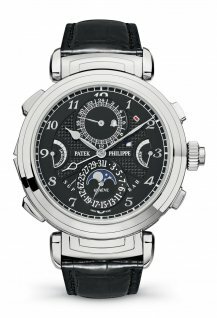 5968A-001, Patek Philippe also assures fitness for use by introducing an innovative fold-over clasp. It has four independent catches for enhanced opening and closing functionality.